The year is 1983. I had just finished Navy Nuclear Power School, Ronald Reagan was president and the fledgling National Organization for Rare Disorders (NORD) helped pass the Orphan Drug Act. What is an orphan drug? It’s a medication developed specifically to treat a rare medical condition. The Orphan Drug Act helped facilitate the development of orphan drugs in the United States by providing extra incentives and protection to pharmaceutical companies willing to invest their time in these necessary, but also less profitable types of medication. In the pre-information age of 1983, where Michael Jackson topped the music charts and Return of the Jedi was breaking ground in theaters, I can only image how difficult it must have been to have a child diagnosed with a rare, genetic disease. The only source of information for many of these families was the local library, which often did carry books related to such uncommon topics. Fast forward 30 years. I have forgotten all but the basics of how to drive a submarine and I’m still trying to forget the parachute pants I used to wear, but the fight to have research dedicated to genetic diseases continues. Last year, President Obama signed the Food and Drug Administration Safety and Innovation Act (FDASIA) into law. Among other things, this legislation empowers the FDA to accelerate approval of life saving treatments for patients with rare diseases. And just like NORD helped push for legislation in Reagan’s days, lobbying by the EveryLife Foundation for Rare Diseases played a pivotal role in the passing of FDASIA. 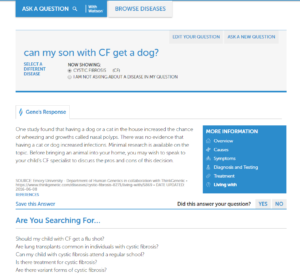 Unlike the children of 1983, today those impacted by genetic diseases have a valuable resource available to answer all their questions anywhere and at any time. At ThinkGenetic, we are on a mission to make finding answers about living with a genetic disease as easy as asking Siri what the temperature is. I am excited to say that ThinkGenetic.com, with the help of our organization partners, has made tremendous strides toward fulfilling our mission. 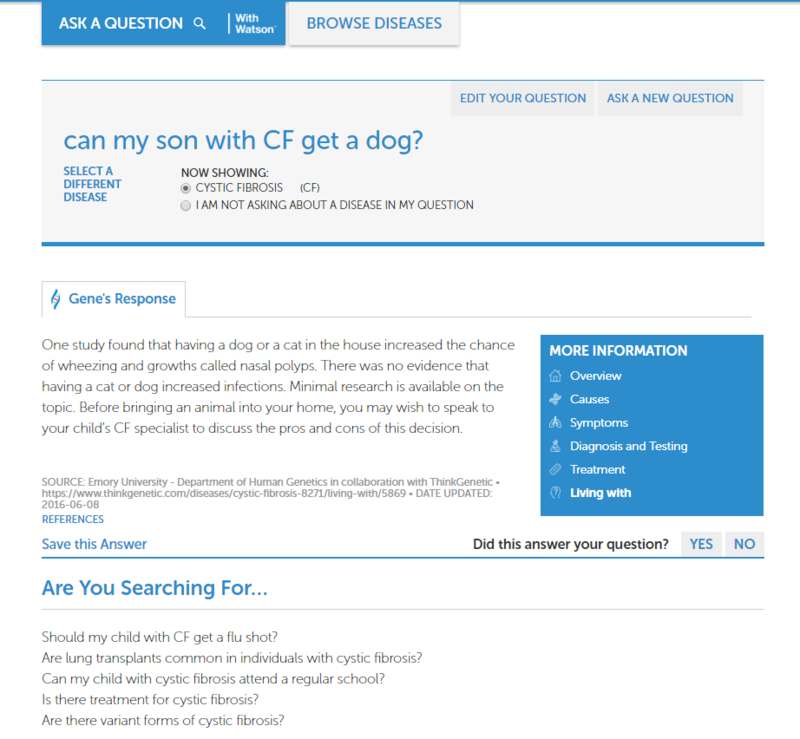 Our “Ask a Question – With Watson” feature has answers to over 20,000 questions about 200 genetic diseases. In the next six months, we expect to expand our database to cover over 500 diseases. 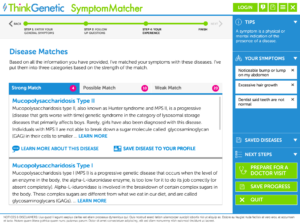 SymptomMatcher for Genetic Diseases. 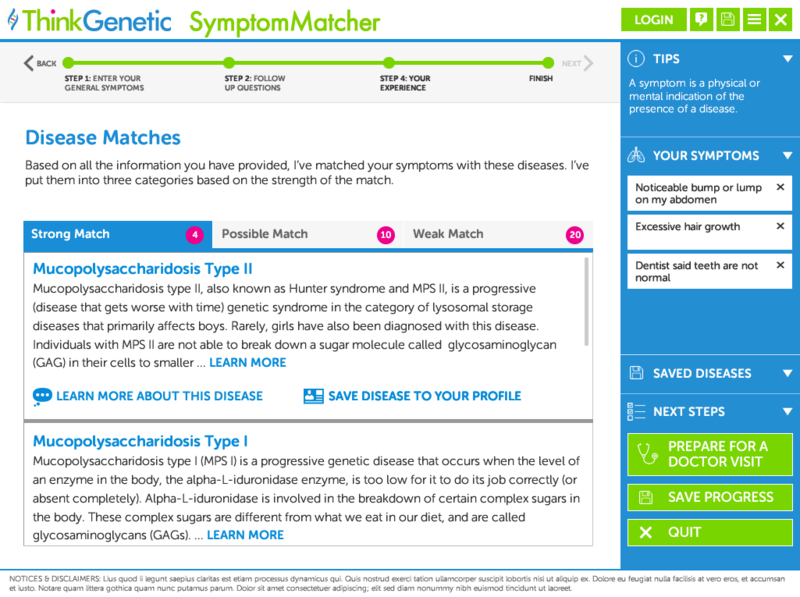 This symptom finder won’t tell you if you have pink eye, but it will give you a list of genetic diseases that match your symptoms. We want to empower people with information and testing options to share with their healthcare providers in order to start the process of overcoming their genetic disease. So I may no longer navigate submarines or wear parachute pants, but families dealing with a genetic disorder can find relief in knowing we’ve come a long way from library searches of microfiche film to find answers about living with genetic disorders. Want to see for yourself? “Ask a Question – With Watson” now. About Len Barker: Len brings corporate leadership and operational discipline to ThinkGenetic as President. 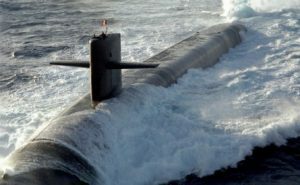 He spent 15 years in the Navy and commercial nuclear industry before founding and growing a series of IT companies that focused on custom application development, education and advanced search technologies. He holds an Electrical Engineering degree from the United States Naval Academy, an MBA from Auburn University and is a licensed professional engineer.